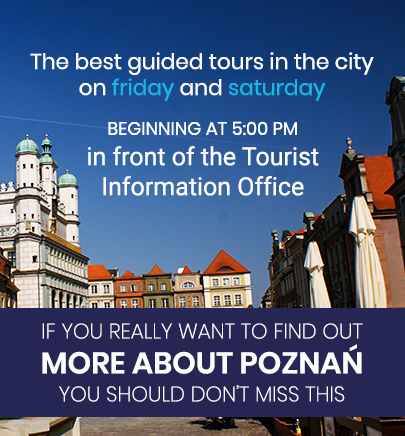 At VisitPoznan we are a group of officially licensed Poznań tour guides. We have been active in the tourist market for 10 years and our Foundation has been established since 2014. The main task of this Foundation is to develop tourism in Poznań. We wish to share our enthusiasm for our home city with our guests – tourists from Poland and from abroad. Every year about 10 000 people explore Poznań with us – with tours mainly in English, Spanish and Polish. We also provide services in other languages, f.ex. Japanese. This is because our guests are so confident in our services after they’ve explored the city with us that they readily recommend us to others. We help guide a wide cross-section of tourist groups thanks to our large offer of specialized guided tours, all of which are custom prepared based on years of insight into our guests’ needs and requirements as well as fresh and interesting ideas on how to best organize our guests’ time. We provide our services not only to typical groups, such as schools, businesses, conference attendees and incentive groups but also to individual guests for whom we have prepared private day trips or afternoon guided walks. We cooperate with almost 20 travel agencies and other companies. To our utmost satisfaction, the groups to which we have shown our splendid city, invariably returned home delighted. We not only explore Poznań with our guests, we also acquaint them with the history of the city, its monuments and walk them through places of interest. We have also created a special tourist information portal www.visitpoznan.info, which guarantees every visitor an augmented tourist experience in Poznań during their time here. The portal provides information on current events, has the newest city news and describes the most interesting cultural events. This is not all, it is also a presentation of real places in Poznań recommended in Poland and abroad, appreciated by the city’s residents. We suggest where to go in Poznań for a good meal or coffee, where to stay overnight or where to go shopping. Welcome to Poznań – we are waiting for you!